Presentation of the report on Senior Employees in Spanish Business Organizations: Realities and Challenges. One in four inhabitants of Spain will be aged over sixty five by 2031. The findings of the study point to senior employees playing an increasingly important role in the Spanish economy over the next 10 years. Ninety per cent of companies do not have a plan of action for an ageing workforce. Only 15%, those with the highest turnovers and largest workforces, have early retirement schemes in place for senior employees. Madrid, June 12, 2018. The management of senior employees and the design of specific policies for this particular segment of the active population will play a pivotal role in growing the labor market according to the findings of a report on Senior Employees in Spanish Business Organizations: Realities and Challenges. The report was presented today by Rafael Puyol, Director of the IE Foundation Observatory of Demography and Generational Diversity, who headed the study. The report underscores the fact that one in four inhabitants of Spain will be over 65 years old by 2031 due to the inexorable ageing process taking place in the labor market, the evolution of which will result in a new labor market with a very different structure. The study cross referenced its findings with the forecasts for demographic change and evaluated the experiences and best practices of 16 European companies with regard to managing employees aged over 55. The study also found that there are several reasons workers over 55 years of age are in a good position to extend their working lives, such as the fact they are doing work which does not take such a toll on their physical health, they enjoy good health in general, and government policies now defend their right to work beyond the age of retirement and limit early retirement schemes. The report also found senior employees will play an increasingly important role in the economy over the next 10 years, which means it is essential to examine the impact of people working beyond retirement age and how it will affect productivity levels on a global level. The study found that only 17.39% of the total number of employees in the companies that took part in the study were aged 55 or older, and only 0.52% were older than 65. Of these, 42.3% had a university degree and 11% had a postgraduate qualification. Eight per cent held senior management positions and they comprised 62.17% men and 37.83% women. The vast majority (77.6%) had been doing the same type of work since before the age of fifty five and almost 86% worked full time. The study revealed that 90% of the participating firms had no plan of action in place for managing senior employees. Only 15% have early retirement schemes for senior workers, and these firms were those with the highest revenues and largest workforces. Sixty per cent offered partial retirement plans aimed mainly at workers aged from sixty to sixty four. PeopleMatters is collaborating with the IE Foundation Observatory of Demography and Generational Diversity by examining best practices in senior employee management in European firms like Altadis, Correos, DKV, Gas Natural Fenosa, ISS Facility Services, Reale Seguros, Banco Sabadell, Zurich, ABB (Sweden), Axpo (Switzerland), Berner (Finland), BMW (Germany), Centrica (UK), Citibank (Greece), Loewe (Spain) and PSA Peugeot Citroën (France). Health and safety in the workplace. It is essential to design a plan of action with regard to healthcare and preventative measures in order to guarantee the physical and mental well-being and of senior employees to ensure optimum performance levels and less absenteeism. Organization and work environment. There is a need to design and implement initiatives in order to adapt positions to the profile of senior employees. Professional development. Firms have to foster the professional development of older employees and avoid knowledge obsolescence. Flexible retirement models. New, flexible work models that are compatible with retirement are key. These must be accompanied by lines of action aimed at easing the transition to this new phase in people’s lives. Preparation for retirement. Employees need to be made aware of key aspects of their post-retirement lives – financial planning, healthcare, leisure activities, hobbies, social relations, technology, etc. Age-based benefits. Recognition of the advantages enjoyed by the senior age group, both during their working lives and their subsequent retirement. Raised awareness and recognition of the value contributed by senior employees. Measures are required to foster an inclusive attitude toward senior employees and an appreciation of their contribution. Generational replacement and succession management. There must be actions aimed at streamlining the replacement of one generation by the next within business organizations in order to ensure a seamless transition. 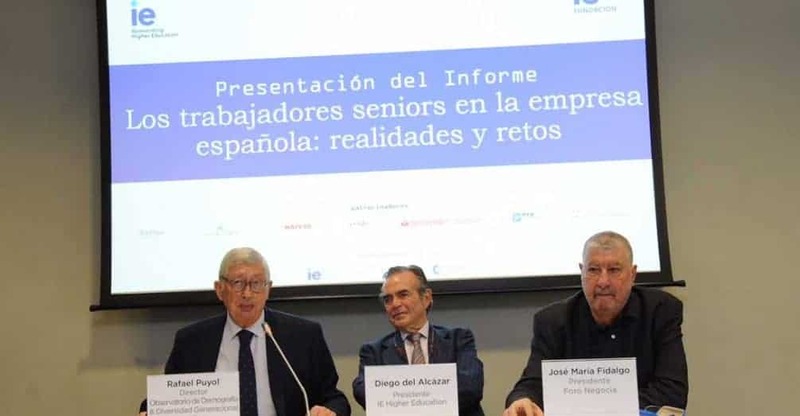 The IE Foundation Observatory of Demography and Generational Diversity, headed by Rafael Puyol, was created in 2017 with the aim of carrying out research and activities in fields related to the effect of demographic variables on business. It has 7 key sponsors – Fundación Santander, Fundación Bancaria La Caixa, Mapfre, Red Eléctrica Española, Renfe, Telefónica, and Sagardoy Abogados – and enjoys the support of collaborating firms like PeopleMatters and a team of experts with extensive experience in the field.